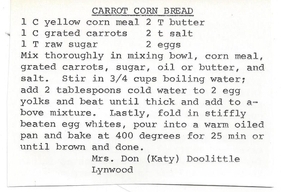 Mix thoroughly in a mixing bowl yellow corn meal, grated carrots, sugar, butter ( softened, or oil), and salt. Stir in 3/4 cup boiling water. Add 2 tablespoons cold water to 2 egg yolks, and beat until thick. Add to above mixture. Lastly, fold in 2 stiffly beaten egg whites. Pour into a warm oiled pan, and bake at 400 degrees for 25 minutes or until brown and done.